When Harav Boruch Sorotzkin (who had succeeded Reb Mottel Katz as Rosh Yeshiva in Telshe-Cleveland in 1965) passed on to the olam hoemes, Reb Mordechai Gifter lived in Telshe-Stone. (he was there after starting a branch of the Yeshivah there, as well as a Kiryah). When he heard of RBS's passing, he quickly came running back, apparently afraid that Reb Chaim Stein would take over the yeshiva. 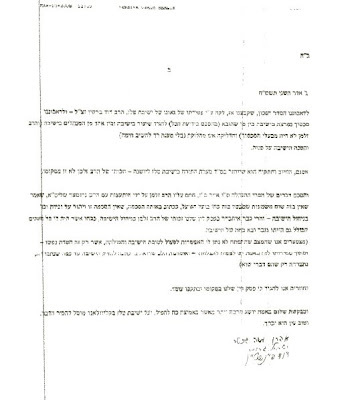 Reb Chaim Stein wrote to him (and Zalman has the letter) that Rabbi Gifter should not worry, he has no inention of taking over the yeshiva, "take your time moving," Reb Chaim said, "the yeshiva is awaiting you with anticipation and open arms." 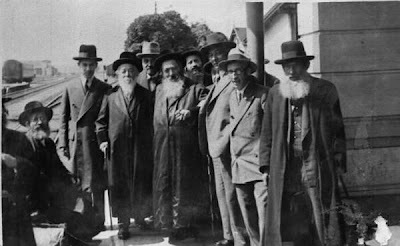 At some point, Reb Chaim Stein convinced him to throw Yankel Velvil Katz - who was the rightful owner of the yeshiva through his own father's (Reb Mottel Katz, a co-founder of Telshe-Cleveland with Reb Elya Meir Bloch, zt"l.) yerusha - out of Telz. 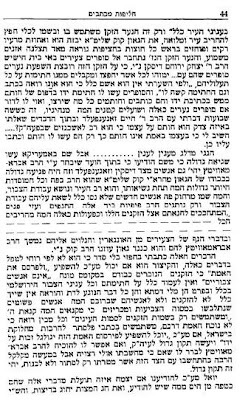 The Katz issue is a side issue because now he sides with Zalman as well as Reb Yitzchok Sorotzkin, surprisingly enough. VeKach Havoh, The yeshiva awaited him with open arms. He served the yeshiva until his passing in 5761. About a year before than He called up two Rabbanim: Rabbi Moshe Garfunkel And Harav Yisroel Grumer, and told them that "I give everything over to my ben Yochid." 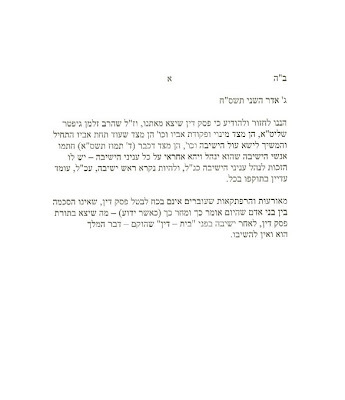 In recent age Zalman brought in a maggid shiur from Lakewood named Rotkin, he was not a telzer, and did not qoute Rav Chaim Telzer, but Zalman said that it's no big deal because "my father (Reb Morechai Gifter) did not either." As well it is also known that Telz was always a Mishpochoh and there were no outsiders. Also when R' Dovid Barkin passed away they blackmailed him and told him that this person whoever called does not want him to say a hesped. (I don't get the last sentence, who blackmailed whom? and with what???) There is more, I just can't seem to write it all down in such short time. Rabbanim here are greatly bothered by the going ons there, for the chutzpah that they have caused the most respected Rav in our community (Rav Grumer) pain. It seems that the Roshei Yeshiva do not respect his psak, this is the biggest attack. I still don't get where this reader is coming from..... is he angry that Rabbi Grumer's psak wasn't listened to, or is he angry that Katz was chucked? Both, I guess. So, we can safely say that since 1979, when Reb Boruch passed away, Telshe has been in turmoil, despite Rav Gifter being there. Please don't question the authenticity of these pictures, they're as real as they come. My question is: If it's so terrible to remove your chalat, not your shirt, c"v, but a thin robe, then why make fun of yourselves and go into the water like that? just stay out! I'm sorry if I sound all "enlightened" to you, but this looks like the Iranian Women's Soccer Team, nothing less. I'm sure to 98% of frum Jews it does too. The boys look happy. I guess. Where does this extreme behavior come from? When I was a young bachur in camp, Chassidishe camp, there was maybe one bachur who never removed his hat and chalatel. And gartel for that matter. 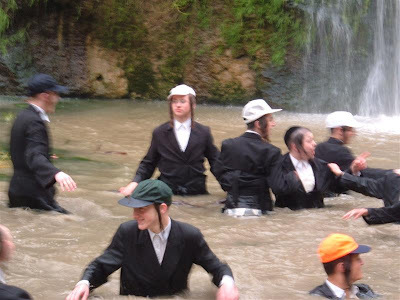 This one was a Belzer chossid, and Belzers are known to always wear hats and gartlech, and I give them all the credit in the world for having the intestinal fortitude to do that, especially in the blazing heat in Eretz Yisroel. Needless to say a bachur like that wouldn't go swimming, that would involve taking his gartel off. Although now that I see that there's the above option I wonder why HE didn't go swimming like that... Back then I never dreamed that it was widespread like this, but you live and learn. 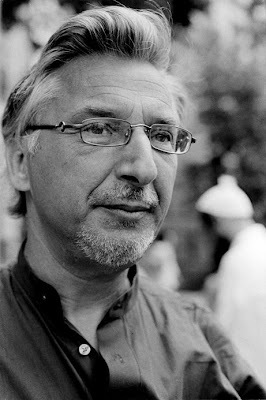 I just wonder why groups like that don't give their adherents the benefit of the doubt when it comes to what the rest of the world considers NORMAL behavior; why they think a bachur can't go swimming without crazy thoughts going through his mind???? 22 Sivan is the Yohrtzeit of my family's hometown in Hungary, Sajoszentpeter, a suburb of Miskolc. A few days earlier the Nazis rounded up the Jews and deported them all to Auschwitz. My choshu've grandmother, a"h, would fast that day till the end of her life, and she lost only siblings, not even her parents! Her parents had passed away years before and she was raised by an older Sister, Malka, hy"D. This picture shows the wedding of my grandmothers' parents, Moshe and Tzipporah Glick, in Sajosentpeter, in 1902. I don't know who the distinguished looking man in the center is, I wish I did. Most of these people probably never made it out of Auschwitz either, although I know some who did, and even one who only recently died. The whole situation there is very unclear, especially after Rabbi Shlomo Miller's quasi-retraction. Maybe the Telshers among you can help clarify the situation. There's more, I'm just having a bit of trouble uploading them. Thanks to a generous reader for sending these in. First comes the letter, "We Support Telshe," they say. AFAIK, RAS sat on an (Aguda?) 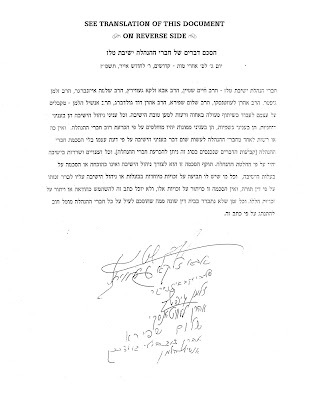 Bais Din in recent years that attempted to adjudicate the machlokes between the Gifters and the Sorotzkins, and that issued a "p'sak" (what it is exactly needs to be clarified) favoring the Sorotzkins. "you are getting involved with petty little snips and everyone will throw in their wisdom. 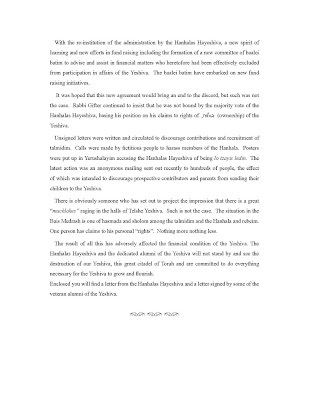 FACT IS a beis din comprised of Rabbi Dovid Feinstein, Rabbi Aron Schechter, and Rabbi Grumer (Rosh Beis Din of Cleveland)issued a PSAK (available for all to see) which the hanholoh defied and seems to do away time and again which in effect has caused all these mini machlokesen which is in effect bringing the place to a close. Self interests and greed is the answer to all the stupid questions one may ask. 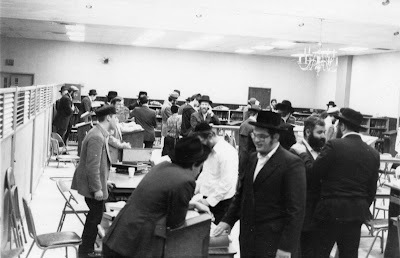 Roshei Yeshiva should never complain that one doesn't listen to beis din just as they signed against Mr. Marvin Schick because in Cleveland they haven't either"
But how RAS could have been chosen to sit in a Bais Din of such magnitude when he is deemed to be a lo tzayis l'dino in the RSC vs RAS and RAF is a great mystery and how Rav Dovid Feinstein could have joined this knowing the details of his father's rulings against RAS is an even greater mystery (or as bray of fundie admits, it is a sign of RAS's "prowess" to be a "manipulator leshem shomayaim" which by now Rav Dovid Feinstein surely regrets seeing where the Isaac Hersh case led to in its massive chillul H-shem berabim, and the role his people had to play in literally dragging Isaac Hesrh out of the pernicious claws of the evil Jamaicans running "Tranquility Bay" and their Mormon overlords and paymasters who had the final word to release Isaac Hersh since they own Tranquility Bay) so the whole thing sounds fishy and incomprehensible for anyone with any decent perspective of the larger picture in the dangerous world of RAS's spheres of influence. Historically CBers have had a very poor view of Rav Mordechai Gifter zt"l (was it because he was more eloquent and more fearless and more gutsy and outspoken than any Cbers? They worked hard to make ash un blotte out of him behind the scenes, but he could care less what they did!) and in the early years when Telz came to America with its gaon'ishe Roshei Yeshiva, Rav Elya Meir Bloch zt"l and Rav Mottel Katz zt"l who managed with their brilliance and above all compassion and mentsclichkeit (two heimishe Yiddishe qualities that lots of the kalte Amerekaner CBers lack) to attract bochurim from Brooklyn to Cleveland in droves in the 1950s and 1960s, something that RYH and the CBers took as a potential rivalry for scarce talmidim in those days, and Rav Gifter eventually had some very sharp things to say about CB when they kicked out their own CB mashgiach RSC on trumped up charges. 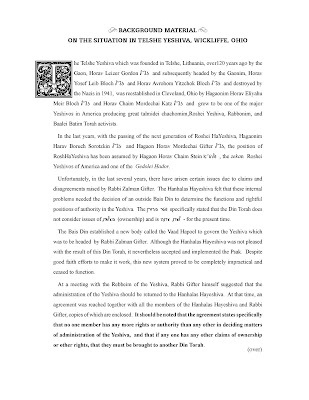 Traditionally Rav Boruch Sorotzkin zt"l was held in the highest regard by RYH and hence by the CB establishment and no doubt RAS was acting out along those lines in favor of the Sorotzkins and against the Gifter faction. How the Gifters accepted RAS as a "dayan" defies understanding, didn't they understand that that meant that the dice was automatically loaded against them no matter which way things were sliced? Go know. Note that RAS's signature does not appear on the letter to rescue Telz from its predicament, nor is he losing any sleep over the fate of Telz in Cleveland. What intrigues me about the book is how it gives every type of reader what he or she wants. 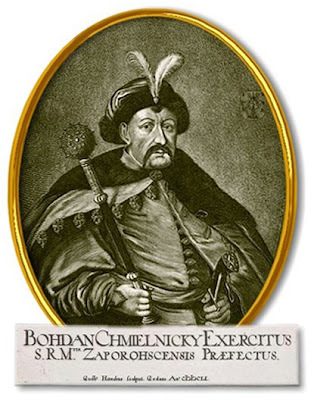 That may have something to do with the author, himself somewhat of a hybrid Chossid/Litvak. 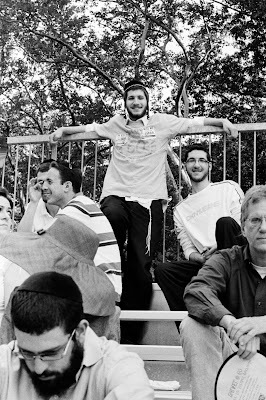 You want typical Rosh Yeshiva/Gadol? He was that. After all, we're told that he was a "Hutnerite" to the end, so that must make him a typical Gadol. You want a trailblazing Kiruv worker who brought hundreds back to Yiddishkeit? Just look at Sh'or Yoshuv and see what he did. You want a supreme mentsh who went out of his way even when he was gravely ill to make people happy and comfortable? You have countless stories like that in the book. As a Lubavitcher I can tell you this is part of what people always saw in the Rebbe - in a much greater way, obviously - that all kinds of people could relate to him, and each would see what he wanted to in the Rebbe. I see a microcosm of that in this book, and I think that the idea to write his biography in such is a good one. I do have a message for Rabbi Besser: Based on conversations here with many people that knew the Rabbi I believe the book is not complete. Don't get me wrong, it's miles beyond anybody else would do, and I appreciate many of the messages that you bring to the forefront, but HOW COULD A BIOGRAPHY ON RABBI FREIFELD NOT MENTION HIS CONNECTION TO THE LUBAVITCHER REBBE, ZY"A? Why is it OK to say that he read American Indian History books just so that he could relate to a certain talmid, but it's not OK to say that he spent time in Lubavitch? That he insisted that the Yeshivah continue its tradition of having a grand Purim parade through the streets of Far Rockaway just so a Jew going to pick up his paper in the morning will see the parade and will get a warm feeling about Yiddishkeit JUST FOR A MINUTE?! These are not your typical CB ideas, I dare say that the Rebbe was the one who gave birth to such an idea, or at least was the one to publicize it, that the Eybershter has Nachas from times when his children do the smallest things, even if a Yid puts on Tefillin once in his lifetime, and that a great part of our mission in this world is to give the Eybershter Nachas!! It is well known that while Rav Shlomo Freifeld (RSF) always was and remained a 100% loyal and true Rav Yitzchok Hutner's zt"l (RYH) talmid muvhak and chosid until the end, that of all of RYH's greatest talmidim, it was RSF who became the greatest admirer of the last Lubavitcher Rebbe, to the great consternation of many of his Yeshiva Chaim Berlin (CB) friends. 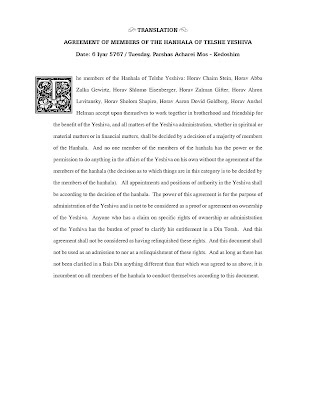 It would be interesting to know if and when RSF went to have yechidus with the Rebbe, and if anyone has any knowledge about this and of what was discussed between them. 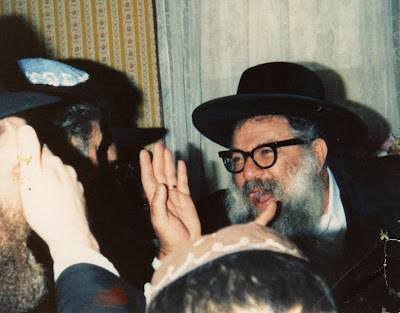 In any case, RYH himself had close ties with both the Rebbes, and the last one was his personal friend -- and RIVAL -- so RSF was simply moving along a familiar pathway of his own Rebbe - RYH. The love between RYH and RSF was very great. So much so that when CB left East New York and moved to Far Rockaway in the early 1960s, and when Rav Avigdor Miller ceased to be the mashgiach at CB, it was RSF who became the new mashgiach for a short time, and when CB left Far Rockaway for Flatbush, RSF remained behind and went on to build his own Sh'or Yoshuv yeshiva from scratch. 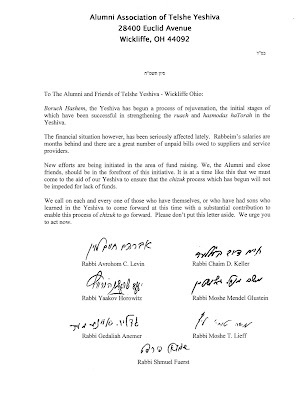 For some reason some CB people were not happy with that, but they have long made peace with it, and now support Shor Yoshuv to the hilt with Rav Naftoli Yeager, RSF's son-in-law, as the rosh yeshiva, while RSF's son was sent into golus to Eretz Yisroel where he has a small Kollel in Yerushalayim. RSF was also a very close life-long friend from childhood of Rav Aron Shechter (RAS). There is a huge picture of the two beardless friends seated up front in light suits in the recent CB 100 Year journal. Their bond was so close that RSF was one of the few people whom RAS would take tochacha from on matters relating to frustrations and problems with talmidim they had in common. In one case RAS had expelled a talmid and it was RSF who "derlanged" RAS on behalf of that talmid when no one else dared stand up to RAS's known scare tactics. And they can be very scary. One wonders what RSF would have told RAS regarding how Isaac Hersh was treated? Would RSF have "blessed" 16 year old Isaac Hersh being sent to incarceration in far off Jamaica by his BT father? A clear-cut case of how NOT to do kiruv! No doubt RSF's views would have led to RAS getting some more well-deserved tochacha. He is sorely missed. RSF guided his closest talmidim to do like they do in Chabad; encouraging recent Baalei Teshuva to take on changing their levush and put on long reklech on Shabbos and grow beards. (for many of them this was no big deal because they were coming as hippies from the counter-culture with longer beards.) 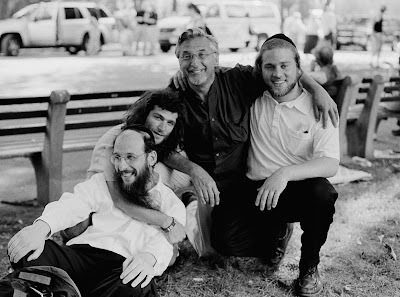 RSF was noheg himself like a Rebbe spending time with the talmidim in yeshiva as much as possible in formal and informal gatherings with the great ruach that he had. Nowadays, under the new post-RSF hanhala they have long moved away from RSF's derech and have tried to build Shor Yoshuv up as a regular Litvishe yeshiva. 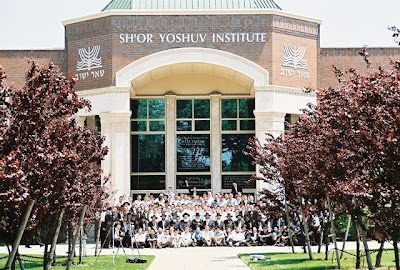 It has basically become a yeshiva for bochurim who do not fit the Lakewood or Brooklyn yeshivishe molds, and they are VERY happy over there, because there is still an awareness of the need for good ruach and freilichkeit that RSF exuded and taught. They are still living off the capital of RSF's genuine heilige charisma. 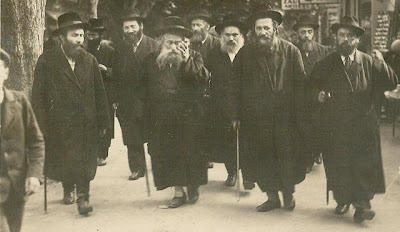 RSF maintained positive links with Chabad until his last days, even though he never became a Chabadnik himself and retained his life-long 100% loyalty to his own Rebbe, RYH. 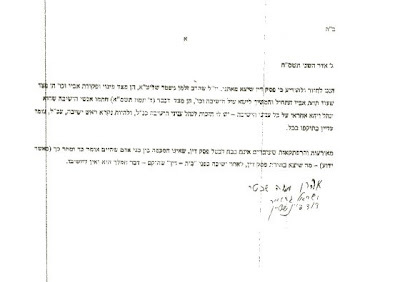 In an interesting final note, unlike other Chaim Berliner Rav Freifeld used to like to tell over that after Rav Hutner had his near fatal stroke and was gravely ill and semi-conscious in bed in Yerushalayim for three weeks fighting for his life before he passed away, he said many things that puzzled his followers at that time, and one of the things that he supposedly said was that the (Lubavitcher) Rebbe was the "Tzadik HaDor," which RSF took in stride and would like to tell it over to a number of people, but the CB people denied it. 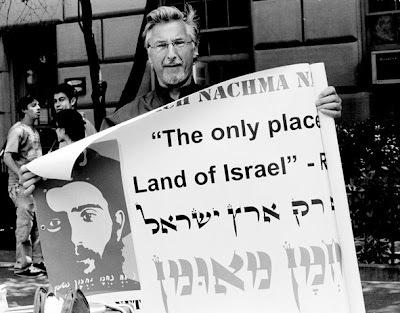 No matter, RSF has made his mark on Jewish and Torah history in America HIS WAY." 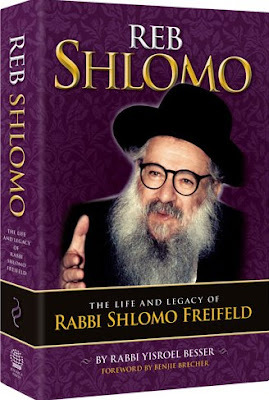 Yisroel Besser seems to have another hit on his hands with his biography of Brooklyn-born Rabbi Shlomo Freifeld, founder of Sho'or Yoshuv Yeshiva. We discussed RSF and his relationship to Lubavitch here, and IIRC the conversation was an interesting one. The fact that it was published by Judaica Press and not one of the big mainstream houses, tells us something, I'm not quite sure what. Yet. I've read about 200 pages and the book, to me, has sort of a mixed message. It tends to be more open and truthful than your typical Artscroll biography, but it still gives you half a story, it picks and chooses when to be all "open." It makes mention of his connection to Rabbi Telushkin, but chooses to hide Rabbi T's identity as a Lubavitcher for the most part. Other times Besser goes the "extra mile" and mentions Lubavitch, but in that "Old Lubavitch was good, New Lubavitch is Bad" kind of way - Freifeld liked old Lubavitcher Chassidim and was proud that he shtammed from that "Old Lubavitcher" town - Nevel, but no mention of his connection to the Rebbe himself. It still makes mountains out of stories, mountains that just aren't there. Meaning: yes, the story is nice, but it doesn't make him great, just a mentsch. I guess that's Artscroll's gift to the world, or is the Hebrew Books on Gedolim that started it all? I forget. A sad commentary on the state of Chassidus today, but very cute indeed. He seems to get his jabs in at almost all groups, save for maybe Karlin. Here's the issue I have with this. 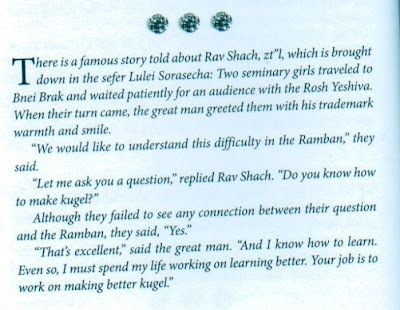 My sisters went to Bais Yaakov and worked hard on subjects like Chumash and Ramban. They had tests and finals, and took it very seriously. Yet, now we have the "Gadol HaDor" putting them down, essentially telling them that all that hard work was for naught, and that all they really needed to learn in the hallowed halls that Sara Schnierer built was to make kugel. I know that had that happened to me I'd be miffed at the man that tells me that, Gadol HaDor or not. Rebuked them gently? Excuse Me?! And where did he see them trying to make a point to him?! "Chabad is the last great hope for the Jewish people, and we are all in its debt." Obviously that's not all he says there, but if you're looking for some groundbreaking statement or expose on Chabad, forget it. It's just not there. Yes, he mentions that there's infighting in Chabad, and that some Shluchim have trouble getting alog with their employees, but what else is new? Why should I bother with that? Anyone Here Disagree? With The Great Shmuley?! The talk is all over the place. 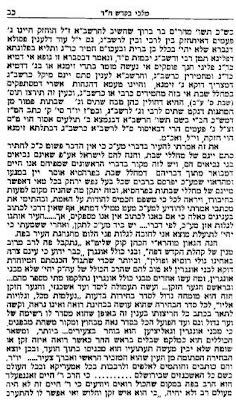 I have yet to see a single Jewish publication that hasn't made a big trask about the 60th Yohrtzeit of the Imrei Emes of Ger, zt"l. I haven't seen the Yated or the Satmar Yiddish papers yet, so you'll have to fill me in on those ones. But all others, The Hamodia, Mishpacha, Kfar Chabad, Sha'ah Tovah, BaKehillah and Algemeiner Journal all have something or other. And rightfully so; rightfully so. There was somewhat of a different angle in the BaKehillah article - although I have yet to see it myself, only heard about it second hand. It's the talk about the succession of the IM - a topic not often discussed. It seems like the IM had seen enough of the daily living in Poland and decided to make Aliyah. He encouraged Aliyah among his Chassidim - despite what Tzemach and Scotty say - and soon was about to lead by example. He considered it a done deal, so much so that on his last visit (1935, I believe) he kept only one day Yom Tov, KeMinhag Bnei Eretz Yisroel. That's right, he was going to leave the untold thousands of Gerrer Chassidim behind and settle in the Holy Land. Permanently. The ground work for the Gerrer Yishuv had been set in Yerushalayim some 9 years earlier with the establishment of the Gerrer Yeshivah "Sefas Emes." 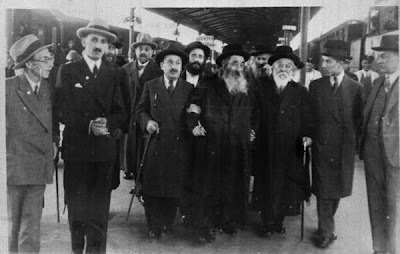 Upon his visit to the Holy Land in 1935 another Yeshivah was established in Tel Aviv for those living there not wanting to travel all the way to the Holy City. So the only thing that remained was what to do with the thousands who would remain without a leader. The answer: Harav Reb Moshe Betzalel, hy"D. He would lead the flock. You may think this is crazy talk, and that never would this happen. Gerrers deny this vehemently, as if there was something wrong with it. One Gerrer told me "RMB was a Temimusdiker, an erlicher, but not a Rebbe." Meaning, that the IM would never leave the Hanhogoh in his hands. Well, let's just see. 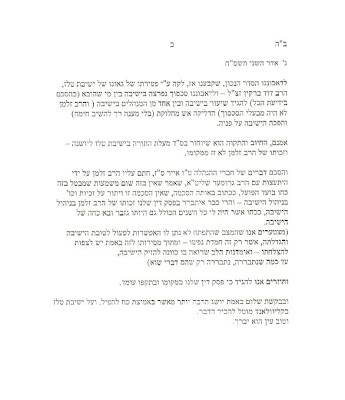 There's a very well known Tzavo'oh of the IM that calls for his son the BY to succeed him. That same note originally names RMB as successor, but makes mention of the שערוריות, the upheavals if you will, and that RMB was no longer with us, having died AK"H at Treblinka. The common perception was that RMB was to succeed him upon his passing, but the article seems to say that he was meant to take over in '35, when the IM was about to leave for Palestine. RMB was of the opinion that he was somewhat to "blame" for the Rebbe not leaving Poland, and that he needed a "tikun" for his "aveiroh." The Vizhnitzer Rebbe, the Ahavas Yisroel, was niftar on 2 Sivan 5696. 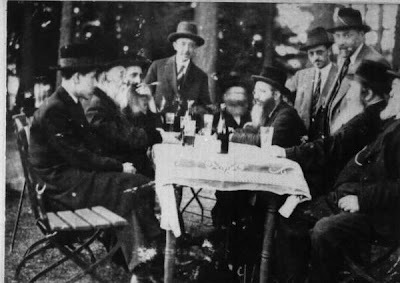 Pictured are the AH with his cousin the Kopycynitzer Rebbe, Reb Yitzchok Meir, zt"l. Notice one thing you don't see much these days: modern-looking chassidim "hanging out" with the Rebbe and swallowing every word. I thank the anonymous donor of the pictures. I believe that's RCM of Vizhnitz seated next to his father. Also seen: Reb Moshe'le Vizhnitzer. 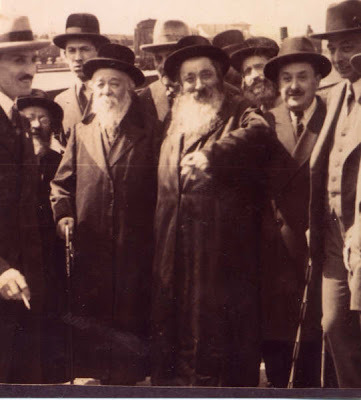 Reb Moshe'le smiling behind his zeide. 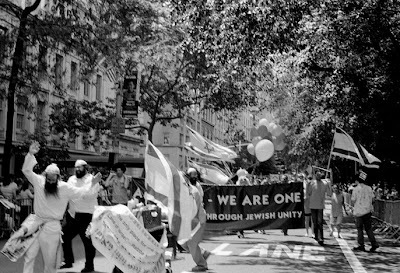 Hundreds joined Am Echad, a new grassroots organization promoting tolerance and unity, in marching at the Salute To Israel parade up 5th Ave. Joining this year, were various different chasiddim and yeshiva students from Satmar, Bobov, Vizhnitz, and Lubavitch. For 3 years, Am Echad has been working behind the scenes with the disenfranchised members of the charedi community who have been misunderstood and abandoned by a community that does not nurture their individuality, leading to a rise in drug abuse, abortions, and desperation. 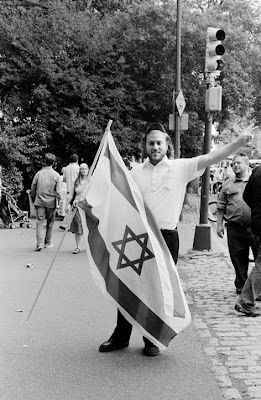 Inspired by Isaac Schonfeld, director of the famous weekly Chulent group, Mark Appel, an Upper West Side businessman and community activist declared yesterday that the war has begun to reclaim our beautiful youth and their potential for greatness, with love and a new sense of hope and trust. We will use every resource available in challenging the Rabbis and leaders to stop this epidemic. Can we trust todays' Rabbis and so-called communal leaders who rip apart their OWN families with litigation and brutal communal disputes to do anything legitimately constructive? Absolutely not, says Appel, who has opened his house 24/7 as a safe haven for kids who have been abused and ignored by their community and families for simply wanting a better and more normal life. LET THE LEADERS TAKE SOME RESPONSIBILITY, and spend money on building community centers, libraries, vocational and job training centers, instead of fighting Lipa Shmaeltzer and organizing highly publicized and generally impractical trips to dead tzaddikim all over the world. LETS FOCUS ON THOSE LIVING RIGHT HERE IN OUR BACKYARD, SOMETIME UNDER OUR OWN ROOFS WHO NEED HELP, LIFE, LOVE, AND CHIZUK. AM ECHAD We are One. Guess Who Made It Happen? I saw this ad recently and it got me thinking. Truthfully only a guy like myself - living in both worlds - would realize a thing like that, but that's why I'm here, to make y'all aware of what goes on in the world. Look closely at the young man standing at the Kosel, all emotional, asking G-d to help him find his way. He came to the Wall, either by himself or with a Birthright type group, and is overwhelmed with emotion by the awe and splendor of Israel and Yerushalayim. On his way to the Wall he's approached by a pesky Chabadnik who asks him to put on Tefillin. 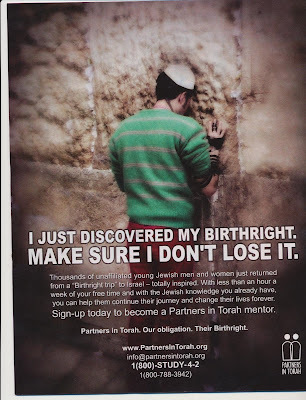 Look how the tefillin is worn, if you don't believe me. It's minhag Chabad. The guy may have had the chance at his Bar Mitzvah to put them on, or maybe not - that's beside the point. The fact that he's wearing a paper "Kosel yarmulka" adds a lot to the picture; it makes for a great paradox, as if only black hatters should be there, or something. I was thinking of asking the good people at P.I.T. 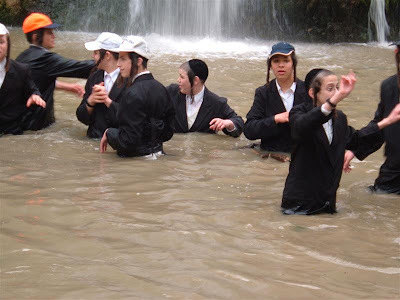 if they made sure that the lad washed his hands and had a Guf Noki before he donned the Tefillin. 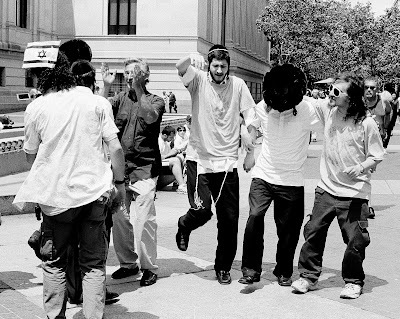 After all, the mentors of the group always had that worry on their minds when condemning the Chabadskers at the Kosel and elsewhere grabbing people in all levels and styles of dress, plopping a yarmulke on the head, and strapping on the tefillin. I happen to know that P.I.T. is a good group of people, so I'm not condemning them, C"V, it's just sort of ironic, that's all. They were also the group that made the Lakewood ger/goy frum, not that it was their fault, but just so you know.